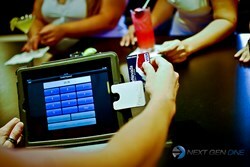 Next Gen Dine by Prelag Partners, LLC announces PhotoSnap Integration on mobile point of sale system. Next Gen Dine strives itself in keeping all credit card information safe and secure. Next Gen Dine restaurant point of sale by Prelag Partners, LLC announced that the PhotoSnap integration onto the iPad point of sale is on its way to help make payments secure and keep customer identities safe. PhotoSnap technology protects against identity theft by taking an image of the credit card holder and matching it to the one on record. If the images do not match, the credit card cannot be processed and the customer has to find a different form of payment. The restaurant sets the limit for what amount of money does not require PhotoSnap. If the tab exceeds the predetermined amount, then the POS will ask the server to match the identities through PhotoSnap. Next Gen Dine strives itself in keeping all credit card information safe and secure. This is why PhotoSnap is a great integration for the restaurant POS. Next Gen Dine is a product of Prelag Partners, LLC. To learn more about Next Gen Dine and services offered, please visit the company’s website at http://www.nextgendine.com/. Next Gen Dine helps keep your credit card information safe and is the future of restaurant dining. For more information about the product or to find out how your restaurant can take part of Next Gen Dine, contact Paul Roberts, Managing Partner at 1-877-342-2218 or paul(at)nextgendine(dot)com. Follow us on Twitter, Facebook, LinkedIn.